The fall season is well underway at LWBC. We have had the pleasure of serving a number of wonderful retreat groups, hosting the Movie by the Lake event with the McFarland Chamber of Commerce, and adding a new member to our full time staff team! Crystal Smith has been a dedicated servant to the ministry over the past few years as a counselor and chapel coordinator, and we are very excited to have her join us here. With the Fall equinox being yesterday, I thought it appropriate to reflect upon the summer which passed us by so quickly. As you may know, Ron was able to take some time for a sabbatical during the summer season. 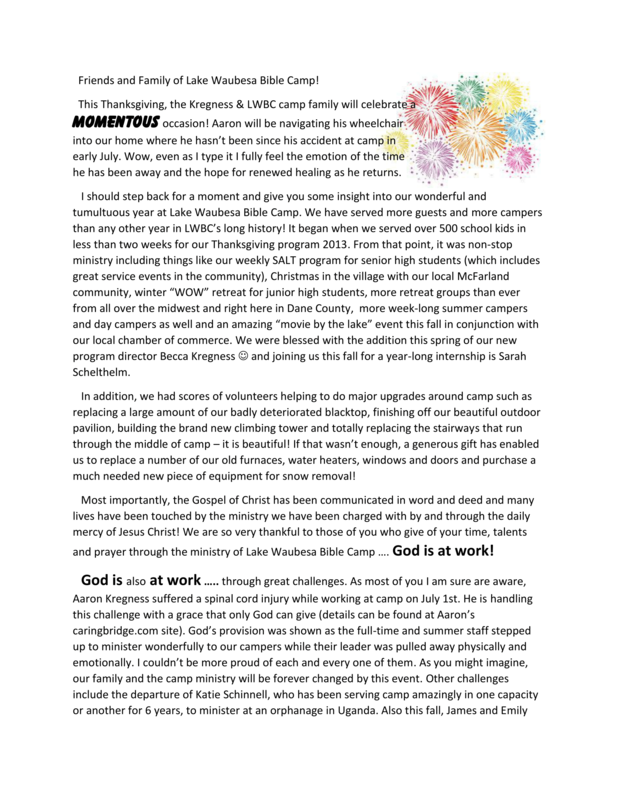 God was faithful in allowing our summer ministry to flourish even though He had given the camp director a period of rest. 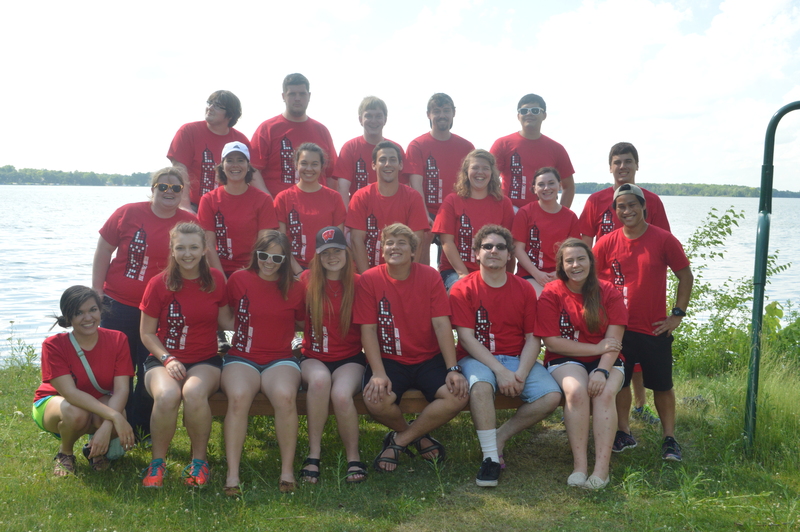 We flourished because God had chosen an incredible group of young men and women to serve at LWBC this summer. We pray diligently for summer staff members, and God absolutely provided for our needs. Any roles left unfilled early in the spring were covered by the time we began our week of staff training. It is amazing to see how those chosen people went and bore fruit, and I am sure it will be lasting fruit. It is an incredible thing to see the result of your work. In youth ministry it often happens that a young pastor will burn out. Supposedly, the average term for a youth pastor in a church is about 18 months. In the summer camp ministry, many summer staffers work for a summer or two, or three, and then graduate from college and move on in life. They don’t get to see the full impact of their work. I have been blessed to see those children that I counseled for many years and worked alongside with as high school staff, become summer staff members. The cycle of growth is amazing. These rambunctious, fun (and sometimes challenging) kids actually do take some of what we say to heart. They internalize it. Their decisions are sometimes influenced by us as counselors and staff members. They reflect parts of us in their own personalities. They remember LWBC because of the people that God has placed in their lives for a week at a time. I hope the summer staff of 2016 realizes that the hard work they did has been life changing for some of these kids and youth. Praise God, we had many campers become followers of Jesus for the first time this summer, or re-dedicate their lives to Him. God had chosen them to do this work, and to bear fruit. Lasting fruit. And just as I have been blessed to see the cycle over the past 8 years, I hope they will see it as well. Spring is a transitional season. It’s the time between the season that I hate most and the season I love most. It’s a time of recovery and anticipation. Sometimes I don’t even realize the oppression of winter on my countenance until it is lifted. Friday March 13th was the first day I really started to get excited about spring. Even though I was exhausted, stressed, and busy; I could not keep the smile off my face. God was so real and so good to me in the moment. God is no less real or less good in the winter. Just as God is no less real or good in times where we ourselves feel cold and lifeless. But the joy I have during the spring thaw (that melts the frost off my heart as well as off car windshields) reminds me that God knows that we as humans are physical beings. And that we need these tangible reminders of His love and provision. We need to see the proof of His promises as the grass turns green again and the leaves start to bud. The word season here in the Hebrew (according to blueletterbible.org, no I have not been to seminary) means: a set time, an appointed time. In other words, there is a set time for everything, and at the appointed time it happens, and it lasts only as long as it has been set to last. This principle is hugely encouraging to me. I don’t know about you but I am much more likely to endure and persevere in something for a set amount of time rather than an indefinite period. It reminds me of the marshmallow test. For those of you who haven’t seen this you can check it out here: https://www.youtube.com/watch?v=QX_oy9614HQ But in this experiment children were placed in a room by themselves with a marshmallow and told that they could either eat it now or wait until the facilitator came back and then they could have TWO marshmallows. Now most of the children didn’t do too well with the waiting. Which to me is pretty understandable. I would like to argue that if the children were given a timer set for 5 minutes or even 10 minutes depending on the child the results would have been much different. When the finish line is in sight, when we have our eyes on the prize, it has been proven that humans can accomplish some pretty amazing things. But so often we get stuck focusing on our current circumstances that we forget where we’ve come from and where we are going. Maybe you are in the midst of the heat of summer. You are experiencing blessing and the cold winds of winter are a distance memory. If so take time to look back and remember what it is the Lord has brought you through. It is easy to become complacent and start to feel entitled to the blessings we receive. We may even get to the point of complaining about the very heat that we were begging for in the winter! When this happens we must look back on what the Lord has brought us through and retrain our brains to be thankful daily. Because the summer too will end. We must rejoice while we have the daylight for night is coming. If you are in Spring like me, it might be time to stop constantly looking back and looking forward and simply be! Savor the sweetness of warmth slowly creeping into every part of your life. In times like these it is so easy to be thankful. It is so easy to find reasons to rejoice. Don’t try to contain that joy. Experience it. Live it. Share it. Capture these moments in your memory to fall back on when the days get dark again. Spring has come! Praise the Lord! Reflections from our not so wintery Winter Blast retreat. We finally have snow! Just in time for NOT the Winter Blast retreat. Fortunately here at Lake Waubesa we specialize in fun with or without snow. If you want to see how much fun our 23 middle schoolers and 10 staff members had you can check out our Winter Blast 2015 album on facebook. But we didn’t just have fun playing games inside and out, we also had a blast learning how to experience the inexpressible and glorious joy of following Christ. Our key verse for the retreat was 1 Peter 1:8 which says, “Though you have not seen him, you love him; and even though you do not see him now, you believe in him and are filled with an inexpressible and glorious joy,” Through looking at the life of David and His prayers recorded in the Psalms we discovered that true and everlasting joy, despite of our circumstances, comes from a relationship with God. We learned that even in the midst of trial and tragedy we can look for and see the goodness of God. All we have to do is ask for Him to show us and then be ready for an answer that might be different than we would expect. Even when it seems that God is silent we can look at His creation and let the rocks, trees, stars, and waves speak to us; reminding us of His presence, His power, and His goodness. In this world there are many good things that can bring us joy: relationships, music, sports, possessions. But that joy–that lasts only for a moment–is given to us to point us to the giver of all good gifts. When we choose to seek God, rather than the blessings He bestows, He will grant us the greatest gift of all: Himself. In the words of John Piper, “God is most glorified in us when we are most satisfied in Him.” God is the truest source of this inexpressible and glorious joy that has no end. A – Admit. Admit that on our own we can never live a holy and perfect life, that we will always be found wanting (Romans 3:23). C – Choose. This one is the hardest and yet most important step. In order to receive this gift of joy and new life in Christ we are required to die. To die to self and so that we might live for Christ (Matthew 16:24). It is a choice to follow, to confess with your mouth and believe in your heart that Jesus Christ is Lord (Romans 10:9) . But let me assure you. He is worth the cost. It is our prayer that all the campers that come through our doors will get to taste and see just how worthwhile following Jesus is. We want them to know that Christianity isn’t as much about rules as it is about relationship. It’s more than knowing about God it is learning how to know God. As we look forward to this new year we continue to pray for our campers; past, present, and future. We would love to hear from you as well if you have stories of how your family has experienced the goodness of God at camp or otherwise. Stay warm and enjoy the snow! Through out the last six years I have been involved at LWBC in various roles from counselor, salt volunteer, activities coordinator, and day camp counselor. I have almost filled as many different roles as I have tried different hair styles. 😉 This fall I am adding full time intern/program assistant to that list and I couldn’t be more excited! For those of you who don’t know me my name is Sarah Schelthelm (aka Sarah Bob for short). I am 24, graduated from UW Whitewater with an Early Childhood and Special Education degree, I love ultimate frisbee, kayaking, singing, and Madison in the summer. My first summer at LWBC was in 2009 after my freshmen year of college. I wanted to find a camp to get all my hours of observation/participation done so that I could apply to the College of Education. I found a lot more than that. I found community in a way I had never experienced it before. There is nothing like working tirelessly with a group of people who share a common goal. I found purpose, “to create opportunities for life change through the love of Christ.” And I found passion; working at LWBC through the years has cemented in my mind and heart the desire to work in full time ministry for the rest of my life. This year God has given me the opportunity to do that through an internship here at camp. My role this year as an intern at Lake Waubesa will be to work closely with the full time staff and assist them in their positions. I will help Becca with programing for things like the Winter Blast, and of course next summer. I will be doing a lot of cleaning and organization (which I am weirdly excited about). I will help Ron with some filing and researching. And of course I will also participate in the making of delicious eatables for the various groups that use our facilities during the not-summer season. I am also very excited to get to continue to work with our high school students at SALT (Supper and Life Together). I am looking forward to growing in my relationship with Christ and my ability to serve His Church this year through this valuable experience. God is good! All the time. Step One: Choose an area and rake all the leaves into piles. Step Two: Put as many leaves as possible into a large garbage can. Step Three: Carry the garbage can to the burn pile and [attempt to] dump the leaves on top. Repeat steps one through three until campers arrive or arms fall off, whichever comes first. One day last week when my arms were very near to falling off and discouragement was weighing down the leaves, I asked James and Emily to remind me why in the world we are doing this anyway. Jesus tells us to make disciples. He says nothing about raking leaves. James’ answer was not original; it was our camp mission statement: “To create opportunities for life change through the love of Christ.” But can raking leaves really play a part in changing lives? Yes, I believe it can. When summer camp is not in session, we still get hundreds of people on the property for retreats, community events, and other school-year programs. For the most part, our staff are not the ones who disciple our guests. They bring their own leaders, create their own programs, and communicate the love of Christ through worship, speakers, activities, and relationships. 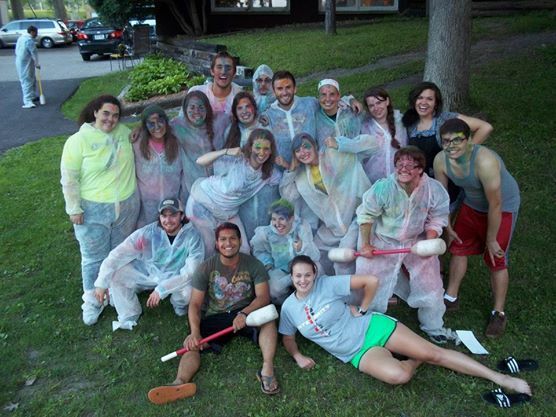 As a camp staff, our role is primarily backstage. We clean, cook, check out ice skates, and rake leaves. As mundane as that sounds, the joy is in giving each group of people the opportunity to spend a weekend not doing those things. Sometimes it’s a lot easier to focus on Jesus when you’re not doing dishes or yard work because a break from the routine of life can help you refocus on what is truly important. The work we do at camp is not glamorous. I am more often found in ripped jeans than dress clothes, more often covered in glitter from craft projects than intentional fanciness, and more often smelling of pancakes than perfume. But Jesus called fishermen to follow Him and God had a carpenter raise his Son and even when He uses ordinary people for ordinary things He is still using them, and that is pretty incredible. Besides, you can’t have a banquet for a king unless there are people to cook the food, right? Whatever you are doing today, whether you are backstage or on the frontline, remember that it matters. Make it matter. Thanks for playing a part in the bigger picture. For anyone who thought SALT (Supper And Life Together) was an original idea of LWBC, it only takes a quick glance at the Bible to see that the concept of doing life together is not a new one. The apostles were the original SALT group, and they set a wonderful example of what a life of fellowship looks like. Since it started more than two years ago, SALT has been fellowship-focused. In a nutshell, it is a school-year program for high school students whose goal is to share life together by providing a positive Christian environment in which they can connect and encourage one another in life and faith. Sound fancy? It’s not. It’s all the normal stuff… together. Why is fellowship important? The entire Bible is filled with fellowship—fellowship with God and fellowship with other people. We can learn better and accomplish more as a group than we can as individuals, and it gives us a chance to love and grow with one another. How do the students benefit from fellowship? Being in a “together” environment offers new perspectives, ideas, and thoughts, and sheds new light on what we are learning. They get to encourage one another during activities and conversations and grow in faith alongside their friends. How do we fellowship? As a group, we play games, have Bible study, discuss spiritual issues, serve the community, and spend time hanging out and catching up, getting to know one another better on a personal level. Last fall, we went through a book called Not A Fan: Becoming a Completely Committed Follower of Jesus and learned what it means to truly be a disciple of Christ, not just someone who sits on the sidelines and cheers Him on. This semester, we are learning from the book Multiply: Disciples Making Disciples because not only does Christ call us to follow Him, but He also calls us to make disciples so others can follow Him too. But we can’t do it alone! SALT is about more than supper, a game, and a good book every Sunday. It’s about the midweek text to check in and encourage someone. It’s about showing up to a soccer game to cheer on your friend even if you have no idea who they’re playing. It’s about conversations in the car on the way home from the Sunday meeting. It’s about friends. It’s about challenge. It’s about building up. But mostly, it’s about God. Because God never intended us to do it alone. Only as a faith community do we begin to see the fullness of God displayed, because in loving one another we are able to love Him more and as He teaches one of us, through sharing He teaches all of us. It’s a relationship with Him… together. We were at supper and I was sitting next to nine-year-old Lois, who was chatting away happily. Kids will be kids wherever you are. Thank God for that! There are 160 children at Noah’s Ark Children’s Ministry Uganda, where I spent three months volunteering in the fall. One hundred sixty children with parents who have either died or abandoned them. One hundred sixty children who will never know what it’s like to grow up in a conventional family with a mother and father and less than 159 siblings. One hundred sixty children who don’t get kissed good night before bed and who don’t know their real birthdays. My heart breaks for these 160 children. While Noah’s Ark is a wonderful ministry and a better home for these kids than most other orphanages or children’s homes in Uganda, it is difficult to forge your own identity in such a big family. I have cried many times over the fact that they don’t have parents and must share caretakers. None of these kids gets to be That Person to anyone, like a beloved child is to her parents. But I rejoice over one thing: Because of the ministry that takes place at Noah’s Ark, every single one of those children knows that he or she is a beloved child of God. They know who He is. The know how He loves them. They know that no matter how many caretakers they have, He is ultimately the One who cares for them. I have seen them worship. I have heard them pray. I have watched them learn. And I know that even though they are missing out on some things in life by not having their original families, that these children are blessed because every single one of them is That Person to God. To all who donated to Noah’s Ark at camp last summer, THANK YOU!! The extra funds were very much appreciated by the Noah’s Ark staff. To read more about my time in Uganda, visit my blog: www.nzekatie.blogspot.com. We recently wrapped up our inaugural Thanksgiving field trip program. In the course of 8 days, we hosted over 550 school kids & chaperones, sharing with them a little about the very first Thanksgiving. We were overwhelmed with the positive response! Personally, I played the part of the Governor of the first colony. On top of cooking 18 – 20 pound turkeys to serve, I also had the chance to talk to the kids about what may have been on the menu for that very first Thanksgiving feast. I started off with a quick object lesson by placing 5 kernels of corn at each place around the table. That represented the daily ration of food for the first winter in the new world before the settlers had a chance to build, plant and harvest. The look on the faces of the kids was priceless. Skip ahead a few days … and our family gathered for our own Thanksgiving celebration. Late one night I was reading a book and listening to my children (of various ages) as they laughed and played together in the other room. My heart warmed at the sound! I am sure you’ve had these moments …. of simple awe, wonder and thankfulness. I know they don’t happen often enough to reflect all the amazing and wonderful gifts that God showers on us daily. Every good and perfect gift is from above, coming down from the Father. ￼Those of you that have been here recently realize how needed the blacktop is on that list and the price tag is over $25,000 for that single item! Should you be interested in giving a tax-deductible gift, you can do that here or simply send a check made out to LWBC. With our humble THANKS! On August 8, 2013 / blog / Comments Off on WA-WA! And the game begins. Campers and staff shuffle around the walled-in court, keeping one eye on the ball and one eye on… well, everything else. Some rush to the middle to stay in the thick of the battle. Many push their friends in front of them to serve as human shields. A few huddle in the shallow corners, hoping those in the center of the arena will battle it out before noticing the stragglers hidden on the fringes. The brave ones rush to the ball and hit it with their hands toward their opponents. The quick ones jump and dodge to avoid all contact. One by one, as the players are hit, they hop out of the court and choose a player to cheer on to victory. Eventually, someone is the last one standing. This is wa-wa ball. 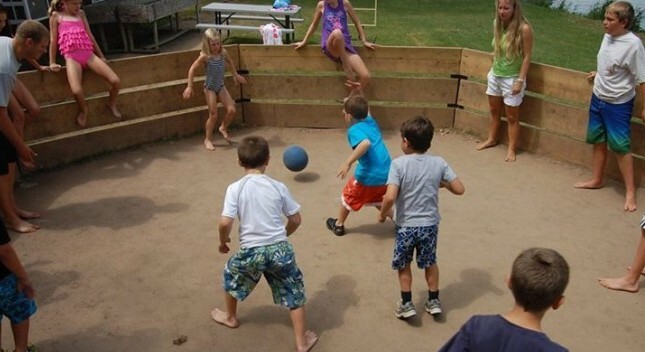 This new summer activity has been a hit with campers and staff alike. The game is relatively simple—it’s a lot like dodgeball in a tiny arena. There is one ball and as many players as can fit in the court. You may hit the ball with an open hand, but if it hits anywhere else on your body, you’re out of the game. Due to some recurring finger scrapes from the wall and ground, the camp store is now selling professional wa-wa gloves that come individually or in a pair, so you can purchase based on your playing style. (The gloves look mysteriously like gardening gloves…) We hold an all-camp tournament every Friday to test the skills the campers have been practicing throughout the week. The court has undergone some pretty drastic wear and tear since summer camp started. Week one it was still grass, beginning to turn brown from the soles of so many shoes. Week two it became a muddy wading pool, deeper with every storm. Now it is mostly compact dirt. Grass will never grow there again, but that’s okay. For years to come, the grassless octagon by the Canteen will serve as a reminder of victory, defeat, and hours of franticly scurrying away from a rubber ball.